Graham Rotenberg is a senior analyst at Hamilton Place Strategies, where he assists clients on a range of strategic communications and policy objectives related to urban renewal and financial services. 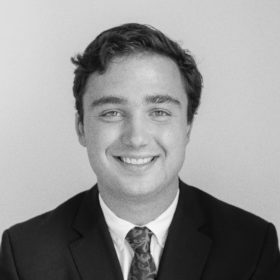 Prior to joining HPS, Graham was a summer analyst at Lazard where he assisted the technology group on mergers and acquisitions execution for software and hardware companies. Graham supported the Lazard team in new client origination, financial analysis, and technology industry research. Prior to joining Lazard, he worked at Raymond James, a financial advisory firm. As a wealth management intern, Graham worked side-by-side with financial advisors and branch managers on marketing, security analysis, and branch administration. Graham also spent two years interning for Altas Partners, a private equity firm. At Altas, he researched trends in global medical education to support the investment team’s due diligence of the healthcare industry. Originally from Toronto, Canada, Graham graduated from Brown University with a bachelor’s degree in Political Science and History. At Brown, Graham played four years on the rugby team and served as editor-in-chief of a business blog that produced bi-weekly content on the intersection of finance, economics, and business.